Do you always feel short on time? With each passing homeschool year (and each additional little student that is added), I feel like my to do lists multiplies exponentially while my time virtually disappears. It is not proportional and something has got to give. I’ve realized that I do not have enough time. I can’t get everything done. But for the longest time I refused to believe that I could not do it all. Have you been there? Are you exhausted from trying to do everything? I can very much relate! Today we’ll be walking through an evaluation of our time. When I talked to my husband about our little homeschool a few weeks ago (no, actually I was complaining to him about it), he asked me a pointed question that I didn’t expect. Umm, what? I expected him to help me solve my problems or to simply listen to my long list of complaints. Instead, he asked me a question that made me stop and think. I have 24 hours just like everyone else, of course! Yet, wouldn’t you love a few more hours? I would fill those hours with books and chocolate and naps. Blissful…. Anyway, I was ready to move past the question because the answer seemed obvious. However, my husband wanted me to spend some time evaluating how my time is spent during the day. He had me spend a few days and log my time. He also asked me to write down my entire to do list on my calendar. (If you’re like me you have the written to do list and then all the extra tasks flying around in your head because you can’t find time to write them down. Right?). When we looked at my calendar together, I cried. It was completely and utterly overwhelming. There was absolutely no way that everything on my schedule and to do list could fit in one day or one week. After our heart-to-heart discussion about how tired and discouraged I was in this homeschool journey, I finally admitted that I did not have enough time to get everything done. My time is limited and it’s crammed overly full with a to do list that has no end in sight. So this semester, I’ve evaluated my time. I’ve made changes. I’ve let some things go. If you feel like you need to walk through a time evaluation, grab your workbook and let’s get busy. Once we finish, I’ll tell you what I learned from my little evaluation. The first step in evaluating your schedule is to see just what you do each and every day. Write out your tasks in 30 minute increments. Keep a page handy for writing down all the thoughts flying around in your head. Trust me, this is one giant step toward having a bit more sanity. Now that you’ve logged your hours and written a monster task list, rearrange your tasks into an ideal schedule. Now, before all the Type-B, creative have a fit, let me just tell you that this is not a hard and fast schedule. This is only to get an overall picture of the tasks you need to complete and the amount of time that each should take. So, now that this schedule is just for reference. This is something that is often skipped on our schedules. I know that I’ve skipped blocking out time for myself for the past few years. This leads to burnout and discouragement. You don’t want to go there! So, pencil in some times for your passions and pursuits. You’ll be so thankful to have that time for yourself! Now go back through your giant lists of tasks and sort them into 3 categories: Must Do, Want To Do, and Would Be Nice to Do. Yes, you’ve just ranked all of your to-do list items in order of priority. Here is where you can look over all your tasks and your calendar and make some hard decisions. Some tasks might need to be moved up in priority and others might need to be completely taken off of your calendar. It’s time to start planning your days, weeks, and months. I encourage you to choose up to 3 big goals for the month and write those at the top of that month’s page. Then choose no more than 3 tasks per day and write those on your calendar. In other words, set some limits for yourself so you are actually able to accomplish the items on your list. Let me walk you through what I’ve learned after evaluating my time. I think it will help you see the bigger picture in your homeschool day and your schedule. 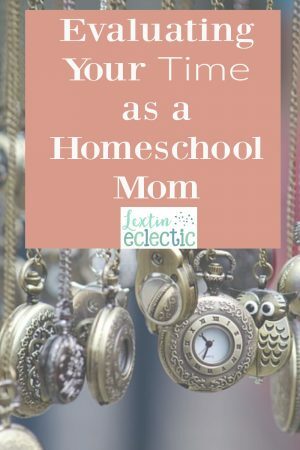 After logging my time I realized that not all of our homeschool subjects were fitting neatly into our homeschool day while staying within the time parameters I had outlined for the day. If I tried to cram everything in to our day, then we would be doing school until, oh I don’t know, bedtime or even midnight. I had way too many things on my schedule with no time for myself. This led me to the decision to change some of our curriculum and to simplify our day. I quit our language arts curriculum that very week. I also set a strict end time for our homeschool day and penciled in some time for myself each afternoon. Best decision ever!!! I put all of our new subjects into our new realistic, and doable schedule and it helped me see exactly where I was spending my time. I make sure I schedule enough time for reading and math instruction and then I fill in with the other subjects. My schedule is flexible but it helps me see if my plans actually fit into my day. Then I created a task list and it was about 2 miles long. I really spent some time combing back over every task and eliminating things that were not priorities right now. After looking over my task list, I prioritized and set some limits for myself. I don’t allow myself to put more than 3 big tasks on my calendar for any given month and I write only 1 or 2 tasks per day on my calendar. I was not being realistic with my time and as a result, I was accomplishing very little because I felt constantly overwhelmed. Now I have 1 or 2 tasks on my calendar for each day and I actually get them checked off. If you are a box checker like I am, you know that instant feeling of relief when another item can be crossed off the list! I also rearranged some other tasks. I decided to quit being a leader for one of our extracurricular activities so I could have some more time back for myself. In this season of busy homeschooling while also having a preschooler and toddler, I am choosing to give myself some grace, knowing that I need to set limits on our activities. I’ve also said no to several other activities and commitments. It was hard to say no because they were all wonderful things. However, I feel like I can finally breathe again because I’ve simplified and cut back on my commitments. It can be so hard to determine priorities and see the bigger picture of your schedule when you are feeling overwhelmed and short on time. I encourage you to do a short evaluation of your time at the end of each semester so you can make sure your tasks line up with your priorities and you don’t feel too overwhelmed. I’ve learned that it’s best to be realistic with your time. I had so many expectations and ideas for our homeschool. Guess what? They weren’t realistic and doable. I’ve had to recognize the areas where I can prioritize, say no, or simplify. But, I’ve become more focused and intentional and I think that’s the best way to approach homeschooling and parenting. So, did you evaluate your time? Did you find that you have WAY too many things on your schedule and on your plate? Write out your action plan and start taking back your time. Homeschooling is humbling and it has taught me all about setting limits, prioritizing, and extending grace to myself. My homeschool style is eclectic because I have to choose resources that will realistically fit into my schedule. I’ve thrown out my idealistic homeschool vision and have become content with a more realistic vision and plan. I’ve defined what homeschool success should look like and have learned how I best homeschool so that I can be more effective and focused. I can recognize the common homeschool traps and I have plans in place to avoid them in the future. I don’t want to repeat those same mistakes! Have you completed the entire homeschool evaluation yet? Be sure to read all the posts in my Homeschool Evaluation Series!